With the New Year just around the corner, many companies are in a rush to capitalize on eager shoppers seeking the latest bargains on everything from technology to baby gear. There isn’t a more important baby gear for an expectant or new mother than a baby stroller. A baby stroller isn’t just for transporting a baby around public spaces, its gear that needs to protect a baby from the elements and provide parents with the sense that they are giving their children everything they need. Not all strollers have been designed the same, choosing the best stroller for your little one is a manner of style, taste, and function. A new mother taking a baby for a walk in a park on even and uneven surfaces is going to want a stroller with strong wheels to meet the challenges of changing terrain while a mom taking her baby on a quick journey to the supermarket will want a more streamlined lightweight model. So, it’s with the spirit of understanding in mind that we present our top ten picks for best baby stroller brands 2019. We’ll lay out the pros and cons plus important things to know about each model enabling you to make the best choice for your baby. Now that you’ve discovered some of the best strollers available on the market today. Here’s what you need to consider in order to get the right stroller for you and your child. What can you afford to pay? This is the most important factor that you need to work out in order to find the right stroller for your child. Be sure to write down your budget price with any slight variations and then stick to it. Having a budget will keep you focused on what’s really important for you to have in a stroller. What do you want to use your stroller for? Are you an outdoorsy type or more of an urban traveler? If you’re outdoorsy, you’ll need a stroller that is all terrain and can easily be used outside. If you’re looking for an easy carry stroller in a car, then you’ll want to consider investing in a simple umbrella stroller that is lightweight and easy to carry. If this is going to be the first stroller for your child and you’re considering adding to your family, you may want to consider looking at models that can accommodate additional seats. Purchasing an expandable stroller for your child is a great cost saver and should be factored in when making your new stroller purchase. Since not all strollers have the same weight it is important to consider what weight you want to carry for your child’s stroller. All-terrain strollers are heavier than lightweight models, so be sure to factor this in during your search as well as your child’s weight and carrying additional bags on the stroller in order to narrow down your choices. One of the single most important parts you need to consider during your search for the right stroller for your child. So be sure to understand how safety features work on the stroller and are sure that safety resistants will keep your child secure without being able to fall out. A strap should be available to attach to your wrist to prevent the stroller from rolling out of reach. All strollers should have a good parking brake with a release mechanism that isn’t easily accessible to a child restrained in the stroller. Strollers with dual pedal braking systems make great strollers for uneven outdoor terrains while a single parking brake works fine for quick trips on even surfaces like to a shopping mall. Moms on the go love the Britax B-agile making it one of the most popular brands on the market and a recent update has made it even better. The Britax B-agile is highly portable featuring super quick one-handed folding with a lightweight design coming in at a mere 18 lbs to make it super easy to store. The B-agile 3 has a three-wheel design that makes it simple to navigate around corners. There is also a reclining seat, a foot brake for easy braking during use and all-wheel suspension making the Britax B-agile a great stroller for babies and moms alike. If you’re looking for a great stroller at a decent price, then you’ll want to check this one out. If you’re seeking a smooth use convertible stroller then you don’t need to look any further than the Thule sleek convertible stroller. As one of the best baby stroller brands, the Thule is a great four-wheel flexible stroller for urban explorers who want a great lightweight stroller to explore urban landscapes with their little ones. The Thule was been designed to meet the needs of active parents and features streamlined maneuverability that can easily accommodate the needs of any growing baby. The Thule can also be set to different settings for optimum child seating interaction with a walking parent from parent facing or forward facing making it a seriously versatile stroller. The Thule is the quality user-friendly convertible stroller with everything you need from a convertible stroller and it shows. Those looking for an inexpensive outdoor stroller need look no further than the Baby trend expedition stroller. The trend is a user-friendly stroller that provides steady performance in outdoor environments making it an amazing brand for active outdoor jogging devotees. The wheel design on the trend expedition stroller makes for straight line use with ease while easily avoiding the veering that comes with some outdoor stroller models. The expedition also folds easily and has double action brakes to bring the unit to a solid stop, it also is easy to assemble making it a great low-cost model for any parental outdoor exercising devote. While the trend isn’t for serious parental jogging devotees, it will provide casual users with a dependable stroller designed to meet their child’s needs. One of the most exciting, fun and popular strollers of 2017 has undergone a major upgrade for 2019, the Bugaboo Donkey 2 doesn’t just have an interesting name it’s an outstanding stroller that can meet or exceed the needs of its many users. The donkey 2 is a great comfortable stroller for babies that can be easily expanded. The Bugaboo 2 features new foam wheels with improved suspension making it an even more comfortable ride for babies. The Bugaboo’s braking system on the stroller allows for easy stopping whether a parent is using flip-flops, high heels, or sneakers. The donkey 2 also provides at the same time a simple to use safety harness for better child security and a long-lasting chassis to ensure solid steady use for years to come. What more can be said about the Donkey 2 other than if you’re looking for quality in a brand, this model has it and much more. If you’re a parent and a serious jogging devotee, you’re sure to love the BOB revolution flex lunar stroller. More than just a standard jogging stroller, the BOB’s recent updating as made it a must-have for serious outdoor exercising with your baby or toddler. Parents are sure to enjoy jogging during evening hours due to BOB revolutionary glow in the dark lunar material that will keep an evening jog with your children safe and visible. The easy swivel wheel makes maneuverability a breeze with a locked wheel feature that keeps the BOB completely stable when going over rough terrain making it a great off-road stroller for any parent. Everything about the BOB has been designed for stability in mind, this stroller is one of the best in the world for a super smooth comfortable ride for babies. The stroller can be heavy, but its pluses far outweigh its minuses making it a great outdoor stroller for you and your child. The baby trend lightweight stroller is a solid lower priced stroller that provides babies with solid basic comfort and protection at an affordable price. The rocket lightweight has a comfortable grip handle plus five-point harness system and it was designed with two cup holders in place which is more than enough to carry a drink for baby and parent. The parking brake on the stroller was designed with a dual-foot activated braking system to ensure proper braking during each and every use. The baby trend is lightweight making it simple to perform quick folding when needed. Its steady sturdy build is sure to be a hit with both moms and dads alike. The lightweight’s build is simple to use due to its simple umbrella design, but rest assured that the baby trend rocket delivers great bang for your buck for a lower priced stroller brand. The model is comfortable, easy to use and lightweight making it easy to carry when you’re busy and on the go. If you’ve got children close together in age, you realize how hard it can be to corral an active toddler to your side while also caring for a newborn, especially when you’re out and about. But, don’t fret because the Joovy caboose ultralight stand on the tandem was surely designed with you in mind. The caboose ultralight as a stand on platform and rear bench seat for older children while a new baby is resting in the front. The Sealed ball bearing wheels on the Joovy makes for great maneuverability and features an outstanding universal car seat adapter to create an individual travel system for a newborn. Joovy’s caboose ultralight can easily navigate through narrow spaces with ease while remaining uniquely stable without any need for additional stroller boards that can become unstable or loose. 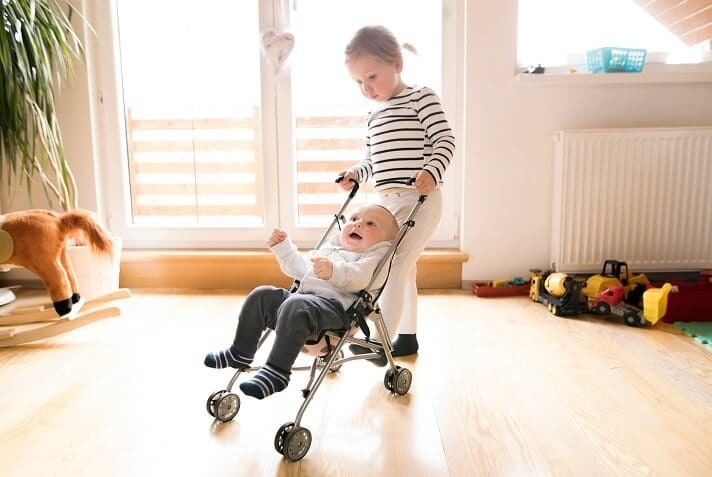 The Joovy is one of the lightest tandem strollers in the world, making it a great model for parents with closely spaced kids who want quality coupled with design. Stroller design has come into it’s on with 4Mom Moxi stroller, the stroller’s design relies as much on innovation as it does on its sturdy design. The Moxi stroller is one of the most innovative strollers of 2019 due to its built-in generator wheels that helps power up the Moxi’s built-in battery LCD system which allows parents to set up details for distance walked, speed, temperature, and calories burnt. But, that’s not the only innovation within the Moxi, parents will also find a mobile phone charger available for use making the Moxi’s one of the first smart strollers. However, the Moxi didn’t just add technology to a stroller. The model provides an above standard canopy and seating system that grows with your baby. It can be used with an infant car seat, then toddler seat in a front facing or parent facing position. While this is a more costly model, the 4Moms Moxi is a great forward thinking stroller designed to meet the needs of busy parents in today’s fast-paced world. Parents of twins are sure to want the Valco baby neo twin stroller. The Baby neo is a lightweight double stroller made to accept the demands of both rough terrains and smooth urban landscapes. It features two independently reclining seat with near flat positions and adjustable footrests. The model’s air tires are durable and made for the bumpy terrains of the outdoors. Featuring a seriously lightweight weight of a mere 27 lbs, the Baby Neo is still fairly slim allowing both riders to have space enough to themselves to rest, sleep or simply take in the world that goes by while they are out and about. The model’s peek-a-boo windows have magnetic closures that provide good coverage while babies are resting. For a double stroller model, the Valco is still solidly compact with the ability to stand on its own. It’s also compatible with many popular infant car seats and features seats that are wonderful roomy providing maximum comfort for young children. Britax’s USA B-ready stroller is good mid-range price stroller with a top seating capacity of 55 pounds. The B-ready features a large canopy with adjustable leg rests and seating that also easily can be reclined to four different seating positions. The wheeling system of the B-ready features wheels filled with foam without air making for a smooth comfortable ride for your baby. There is no need to purchase an additional bassinet system for the B-ready due to its built-in one and you can easily attach a rear or front facing car seat to the stroller. With the B-ready, users will also discover the model has a five-point harness system, full wheel suspension, a large canopy with four different rest positions to choose from giving users everything they might need to provide a safe comfortable stroller for their growing baby or toddler. The under storage area on the stroller is also large enough and accessible enough to place diaper bags and other needed accessories within easy reach making this stroller a great stroller for a great price. A great stroller is a must-have for new and more experienced mothers alike. So, take time to review our picks and then do a research on your own to discover the best ones for you and you’ll soon be on your way to having the best stroller for you.